Home Non classé How much does it cost to rent a private minibus in Paris? Whether you are planning to organize a group trip to attend an event/exhibition in Paris or simply want to embark on a city tour together with your friends, colleagues, or a family in a private minibus — do not hesitate! Our highly driven professionals are at your disposal for an unparalleled level of comfort, which is what we really want you to feel! To ensure a higher standard of comfort that passengers require during group transportation, we decided to go for the best, time-tested minibuses on the market. A Mercedes Sprinter minibus is a perfect fit for our clients as it offers a full range of amenities to satisfy all your needs. Minibuses in our fleet accommodate up to 16 passengers and are packed with onboard WiFi, iPhone chargers, air conditioners, DVD players and LCD screens. Providing a lot of room for passengers, a Mercedes Sprinter is non-restrictive in terms of free space if compared with other vehicles. A large sliding entry door provides easy entry and exit, and the height allows passengers to stand and walk to their seat. Also, you can take up to 16 bags as there is enough room for placing them conveniently in a car compartment. The vehicle’s interior is made of black leather and as functional and flexible as it is luxurious. We offer free onboard drinks and snacks for all our clients. Our list of rates is divided into hourly rates and daily rates and is classified in accordance with your personal needs. This plan is good for those who think of going on a business trip or attending events in Paris. For your convenience, it is provided on an hourly basis. 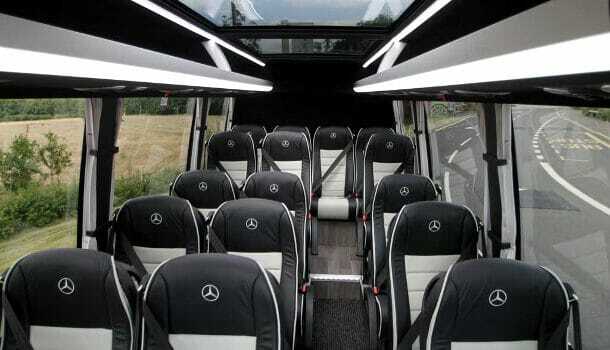 A fixed hourly rate for booking a Mercedes Sprinter is €120 per hour with a minimum of 2 hours. A good choice for people going to a wedding or planning long trips. This plan is provided on a daily rate basis. Weddings and longer trips plan includes 10 hours for a total of €1200. Take the hassle out of getting from/to the airport in a group with our airport transfer service. Airport transfer service is available on your request; the cost of transportation in one direction with 1 hour waiting at the airport is €350. At MyDriverParis, we have plenty of options to choose from. Reserve your vehicle now and benefit from optimal prices!